-Feel empowered to take action and know how to do so. -Have a visceral, emotional experience that sparks empathy. -Understand that this is a foster youth-driven project that welcomes and empowers foster youth. 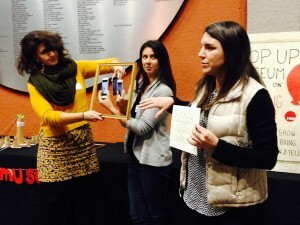 Shortly after, Lauren Benetua, was introduced as the MAH’s newest staff member and Dialogue Catalyst who will be working on the third big idea through community engagement activities with C3ers. 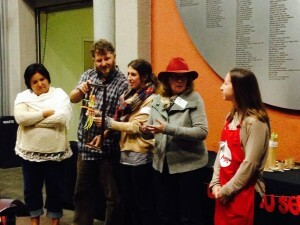 Our talented and excited artists who will create three projects around the first two big ideas were then introduced: Melody Overstreet, Elliott Taylor, and Bridget Henry. After introducing themselves, the artists gave a general explanation of what they were going to focus on in their projects. Melody will bring light to inspirational actions around the “little things” that can make a big impact on foster youth lives. Elliott will skillfully create a 3D immersive experience that sparks empathy and shares stories of foster youth resilience. Last but not least, Bridget will bring to life experiences of transition age foster youth through artful storytelling that will also spark empathy. This meeting’s focus was to figure out how these projects were going to take form. Project brainstorming workshops took place in the atrium where each artist had a table for discussion. 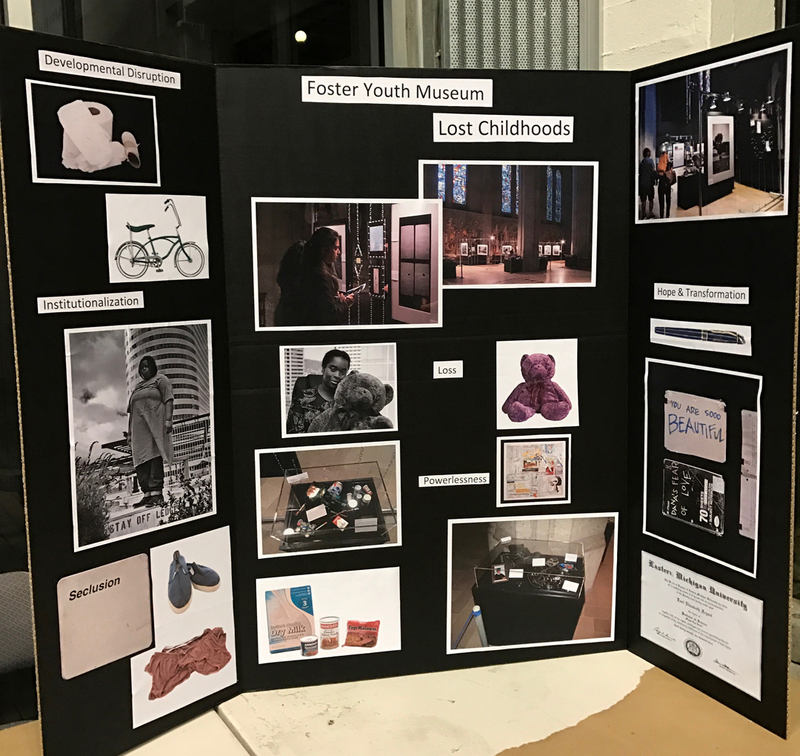 Our partner, The Foster Youth museum (FYM), also had a table where C3 members were able to engage in asking questions and understanding the main sections of their portion of the exhibition. You can view their slides here that show the key sections in their exhibit: Powerlessness, Developmental Disruption, Institutionalization, Loss, Hope and Transformation. 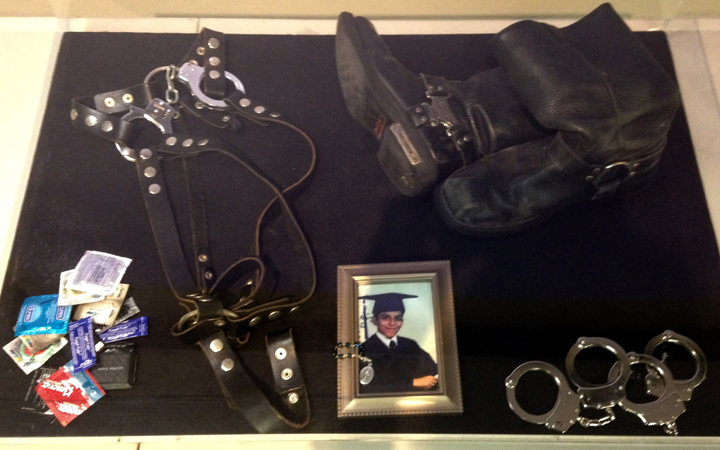 They use artifacts, photographs and youth stories to focus on the big idea that visitors understand the authentic experience of foster care from a youth’s perspective. C3 members got into groups and had the opportunity to contribute to each project by rotating to each table every fifteen minutes so everyone got to contribute to each project. We asked questions like: What does this project look like? What does this project feel like? What could this project include? 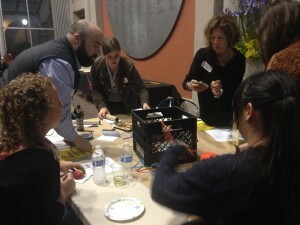 I had the privilege of hearing many ideas propelled and thrown around at Bridget’s table. There was discussion about the stories of losing your childhood being represented as metaphors which got people thinking about rollercoasters and kids in adult clothes. Although it was a bit difficult narrowing down what this piece was going to look like from an artistic perspective. Former foster youth and advocates mostly shared hard times that youth experienced. 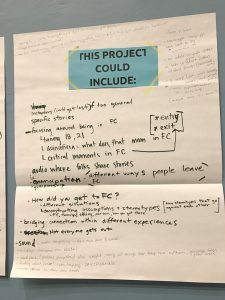 Despite a conclusion not being reached on the physical form, all these shared experiences brought Bridget closer to understanding the complexity of the foster youth experience and the need for specific, metaphorical stories in her project. 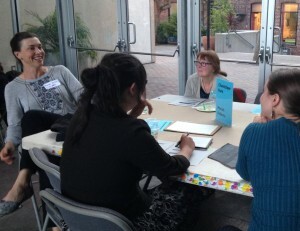 While I didn’t get the chance to listen in on Melody and Elliott’s table, in a short artist discussion after the meeting, all artist felt they came out learning something new and were inspired by C3ers’ comments, stories and ideas. 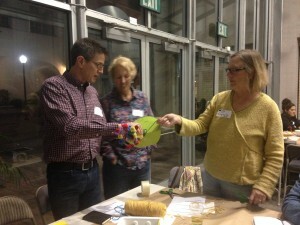 You can see all the notes from the workshop here. Perspectives were broaden with the help of our amazing C3 members. After the meeting, Stacey and I met with the artists to narrow down their project idea based on C3 feedback at this meeting. 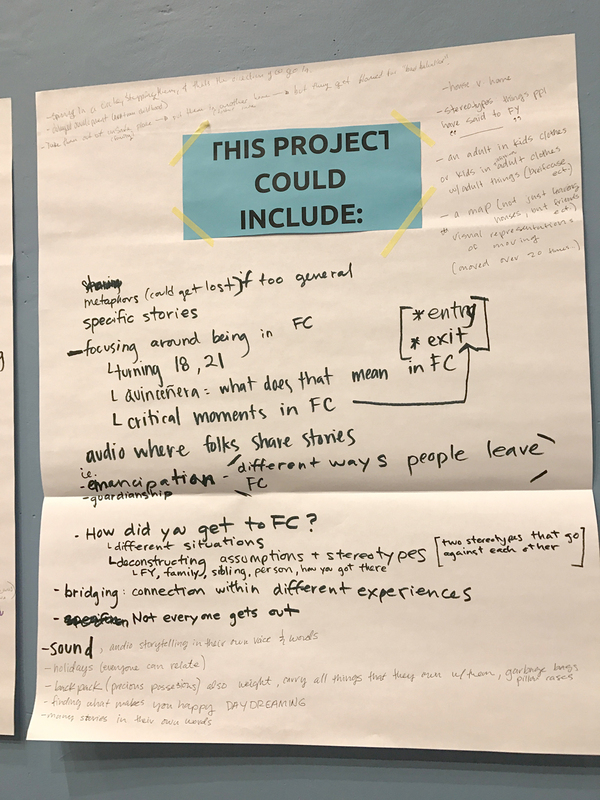 We’re excited to share with you all the direction they are headed and how you can participate in each project’s development at the next meeting Tuesday March 7th! This entry was posted in Blog on March 3, 2017 by Stacey Garcia. 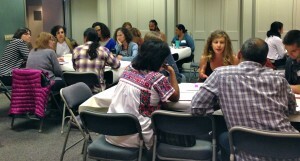 Sunday’s C3 meeting was centered around the topic of foster youth lives. 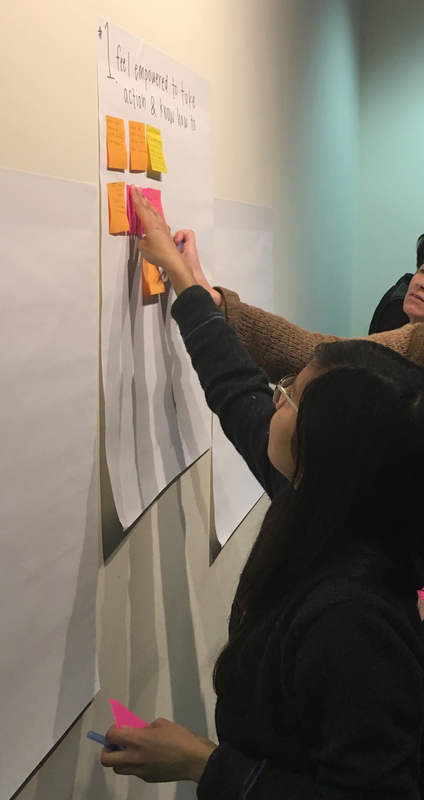 An important aspect to discussing this topic was providing input from the different perspectives from our members who ranged from transition age foster youth, advocates, community members, and artists. Gathering different perspectives was key to brainstorming and developing the ideas for the exhibition called “Lost Childhoods”. Having foster youth and former foster youth a part of this project is very important as we hope to communicate to the public that this exhibition is a foster youth-driven project. 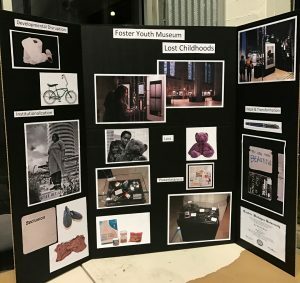 After Nina Simon, Executive Director of MAH, gave an informing lecture on an intro to exhibits, the Foster Youth Museum team (FYM) was introduced as our partners in collaboration with the “Lost Childhoods” exhibit. The founder and director of the FYM, Jamie Lee Evans, was a former foster youth herself and has helped create this exhibition in other parts of the Bay Area, such as Oakland, through the perspectives of foster youth. What are the biggest misconceptions about Foster Youth? What questions do you have about foster youth? What does foster care feel like? 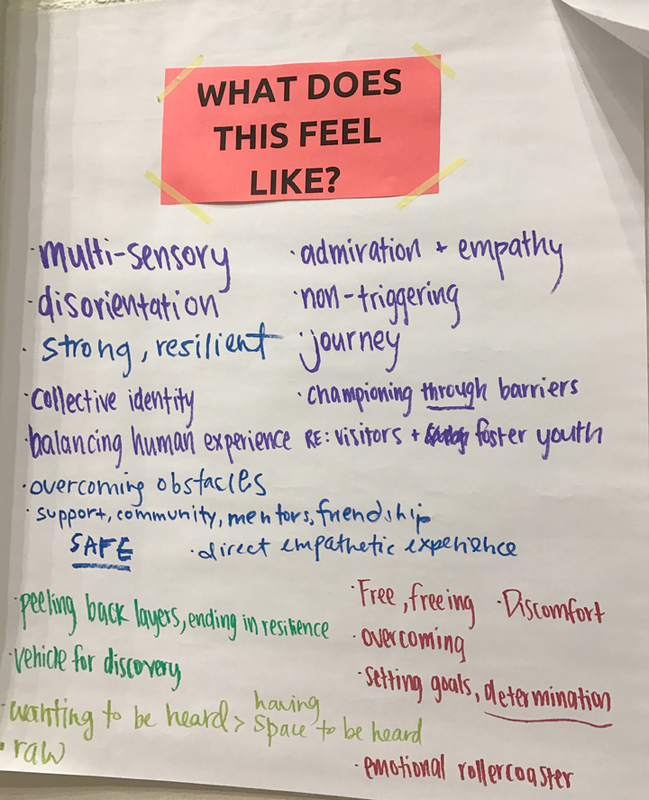 What is unique about the foster youth experience here in Santa Cruz County? You can read the answers here. After writing responses to these questions, the group moved to the auditorium to discuss what the main ideas would be in the exhibition that foster youth would like visitors to understand. feel empowered to take action and know how to do so. have a visceral, emotional experience that sparks empathy. 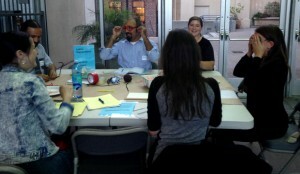 understand that this is a foster youth-driven project that welcomes and empowers foster youth. make a connection to a personal experience they had (family, childhood, etc). learn the basic history, facts, and risk factors of the foster care system. 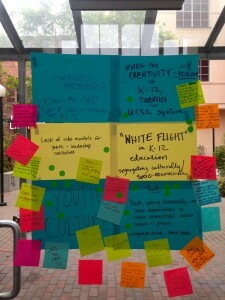 Individually, members wrote their final thoughts on post-it notes and stuck them on the corresponding “big idea” poster. You can read these notes here. 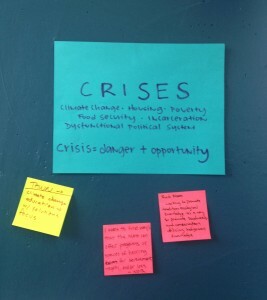 Members wrote down their feelings, ideas, stories, statistics, objects, names, organizations, and resources connected to the topics. 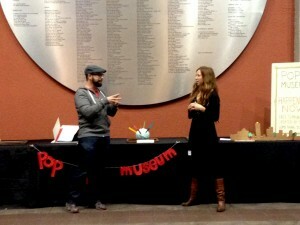 Afterwards, members ranked their top five big ideas and gave feedback. We finally conclude the meeting by gathering in a large circle and saying one word that represented how we felt. We hear many words like hopeful, joy, happy, optimistic, and excited. We’re excited too. This entry was posted in Blog on February 5, 2017 by Stacey Garcia. This meeting explored projects and ideas related to Economic Opportunities and the ways that we can tackle economic justice issues to enhance cultural bridges— creating powerful opportunities for people throughout our county. 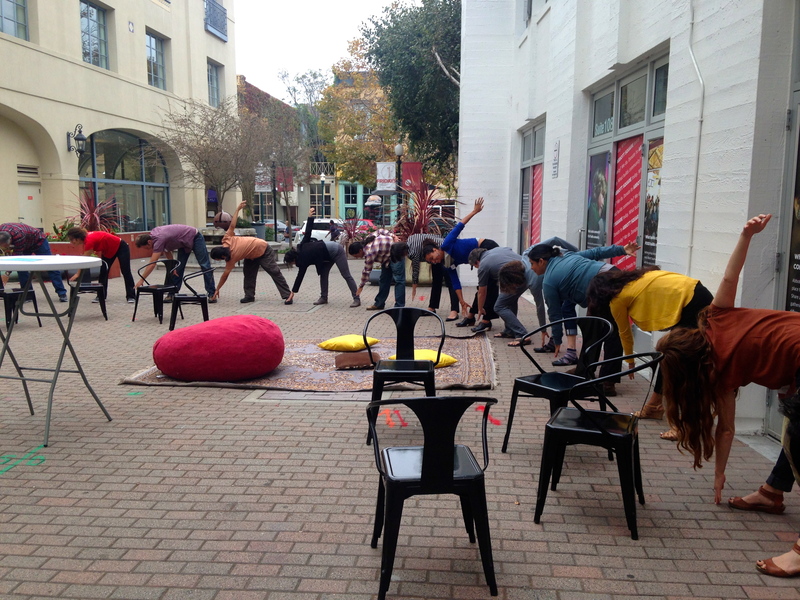 Our interns and staff designed an icebreaker, The Privilege Walk, inspired by this activity. This required a lot of trust and openness amongst our members. 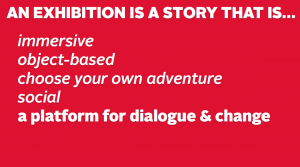 It’s designed for participants to experience what it’s like to be someone else, to further understand how social memberships (age/disability/religion/ethnicity/sexual orientation/gender/citizenship) can affect our lives and our access to opportunities in society. When we think about creating equity and access to economic opportunities, we have to think about changing the system and roots of these structures, not just their effects. Our 4 “Sparks” then led short 3 minute presentations on their projects related to economic opportunities and their dream for its future. Then, all members chose which project they would like brainstorm further. 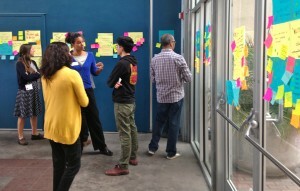 Groups formed around each topic for a more in-depth workshop. Members first shared their interests in joining the group and then asked the presenter more questions about their project. Groups then brainstormed ideas to strengthen the dream. Each group then built an artifact of the future for our Pop Up Museum that was representative of that dream out of cardboard, paper, pipe cleaners, tape and markers in a mere fifteen minutes. Objects and labels were presented to the whole group and can be viewed here. At the end of the meeting each individual either made a commitment to strengthening this work. 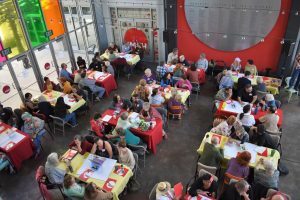 We’re looking forward to the next few meeting which will explore creative ways to ignite cultural bridges with the public in our C3 3rd Friday Festival this June. This entry was posted in Blog on January 16, 2016 by Stacey Garcia. 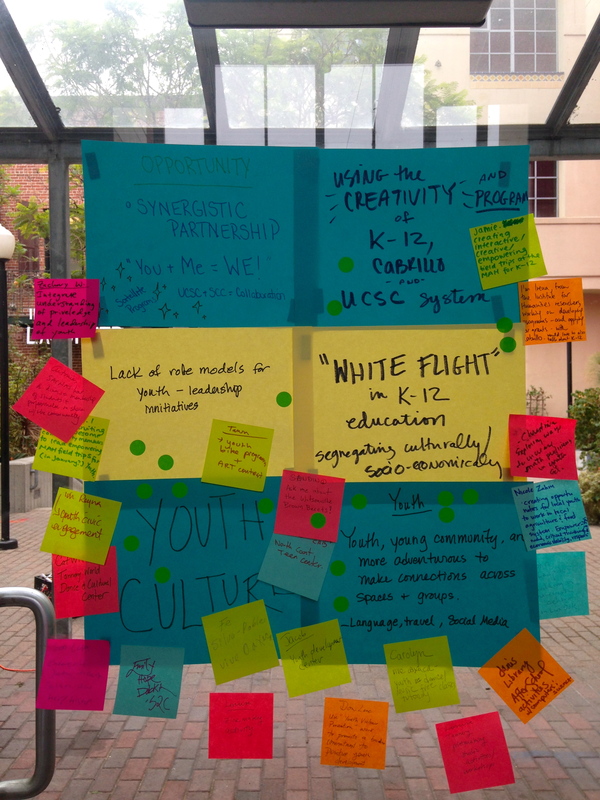 At our first meeting in October we did a lot of brainstorming across the walls of the Atrium to distinguish what avenues we could utilize in order to bridge cultures and raise awareness in Santa Cruz. Of all of these, Sharing Stories seemed like the most natural starting point. Today so much of the stigma associated with cultures and experiences that are different to our own stem from simply not knowing and therefore not understanding them. By sharing the stories of multiple cultures, backgrounds, and identities, we can better understand where we each are coming from to create a more tolerant and accepting Santa Cruz. As our members walked in they answered the question: “If you were a novel, what would your title be?” Try answering it yourself. It’s a hard one. 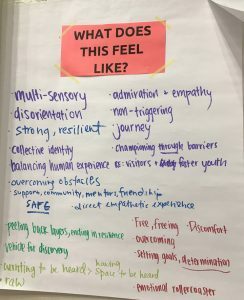 We then jumped into the meeting by doing an icebreaker where we had short, one-on-one conversations starting with imagining your partner as a child to ending with reflections on racial prejudices. This was a natural segway to our lightning talks for the topics of our focus groups. UCSC Humanities with Irena Polić discussed how graduate UCSC Humanities students could work with local organizations to activate cultural bridges in our community. Story Sharing with Wes Modes explored the different ways story telling can create cultural bridges by creating safe spaces for listening. 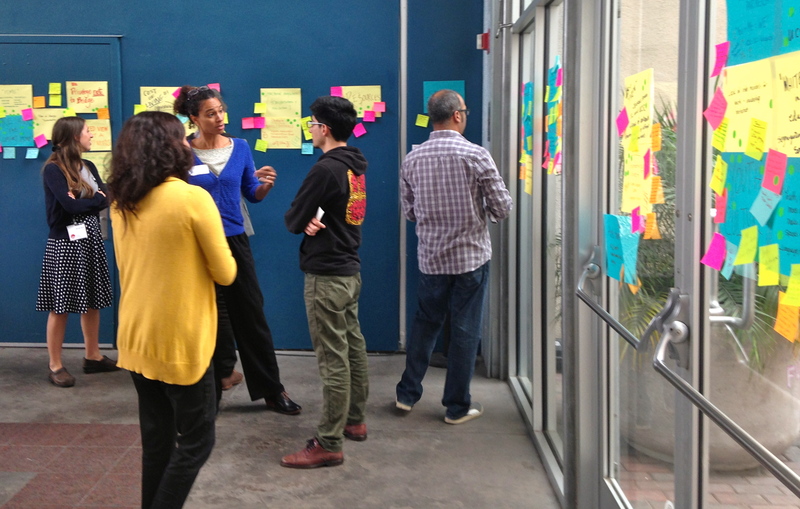 He brainstormed with C3 members different ways their projects could be activated through listening and storytelling. 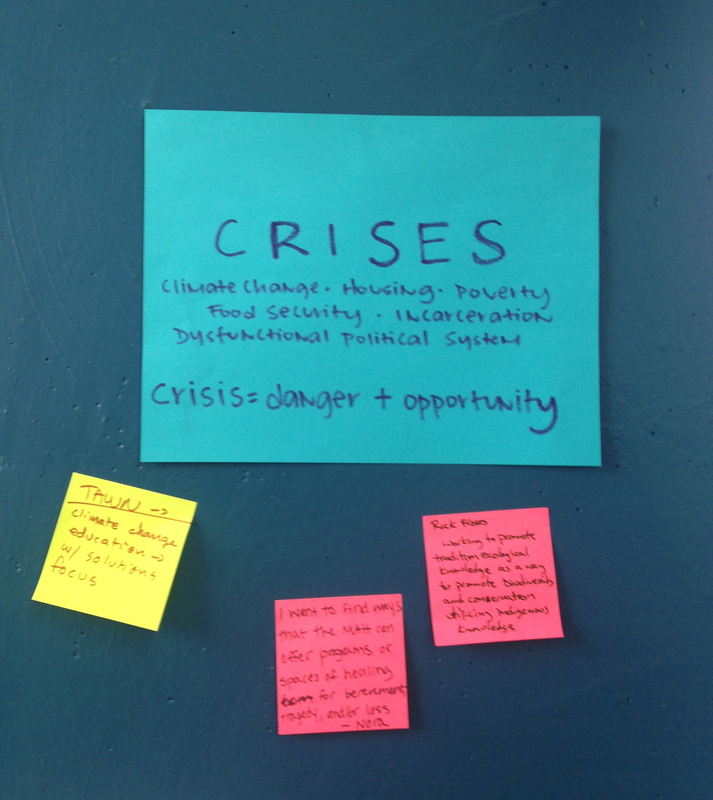 We then dived deeper into these topics in small groups. Each group brainstormed their dream for the future of their respective endeavors, finally creating an artifact for the Pop Up Museum. It got a little arts and crafts-y when the pipe cleaners and cardboard came out, but the ideas created were innovative and important. 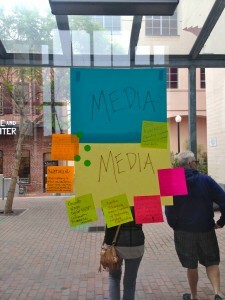 We had designs ranging from helmets to let you see the world through a different cultural background to a mobile interface allowing the people of Santa Cruz and beyond to connect their ideas and feelings. Our meeting ended with a group circle with announcements and commitments. Throughout this meeting you could hear conversations of shared interests and backgrounds which could now be voiced to the group. 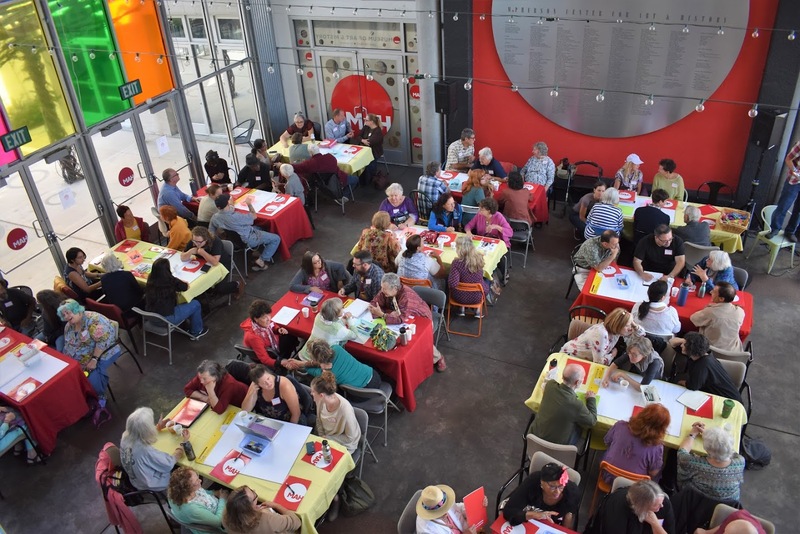 As the members bounced around the MAH’s big red ball, they voiced something they were committed to doing, whether that was volunteering for someone’s organization or simply learning to listen more. 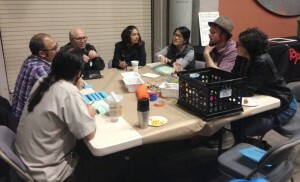 At this meeting we learned the value of listening and making room for others to share their stories. We made cross-county connections and commitments dedicated to sharing culture. This entry was posted in Blog on November 17, 2015 by Stacey Garcia. 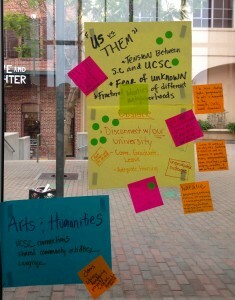 These are photographs from our brainstorm of Opportunities & Obstacles for Cultural Bridging in Santa Cruz County. This entry was posted in Blog, Uncategorized on October 7, 2015 by Stacey Garcia. We were so happy to have you all here for the C3 kick off on October 3, 2015. 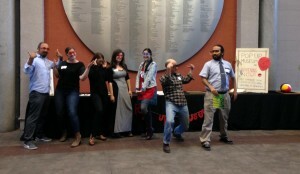 Here’s a quick synopsis of our meeting in case you missed it (or want to relive it). What an incredible group of County leaders we have in C3 this year! We had a great kick off meeting for C3. 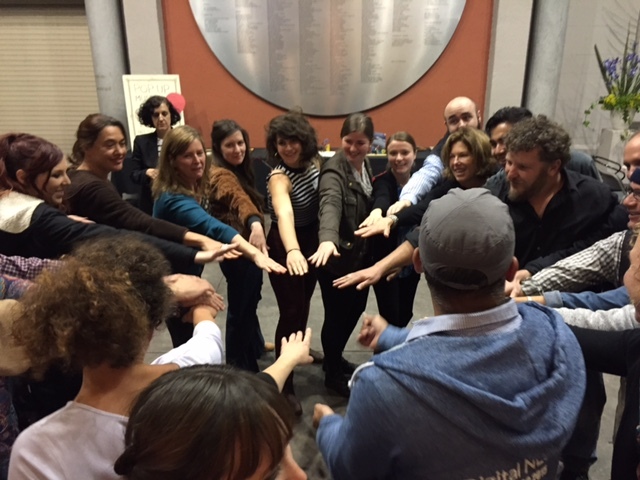 It began with a few icebreakers that allowed members to get to know one another, and some reconnection about why we are all coming together to do this work. 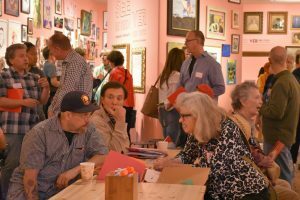 What are your hopes, dreams and/or visions for a more connected Santa Cruz County? Where do you currently see “pockets of greatness” – positive evidence of cultural bridging in Santa Cruz County? Where do you see opportunities for cultural bridging in Santa Cruz County? What are the main obstacles preventing cultural bridging in Santa Cruz County? 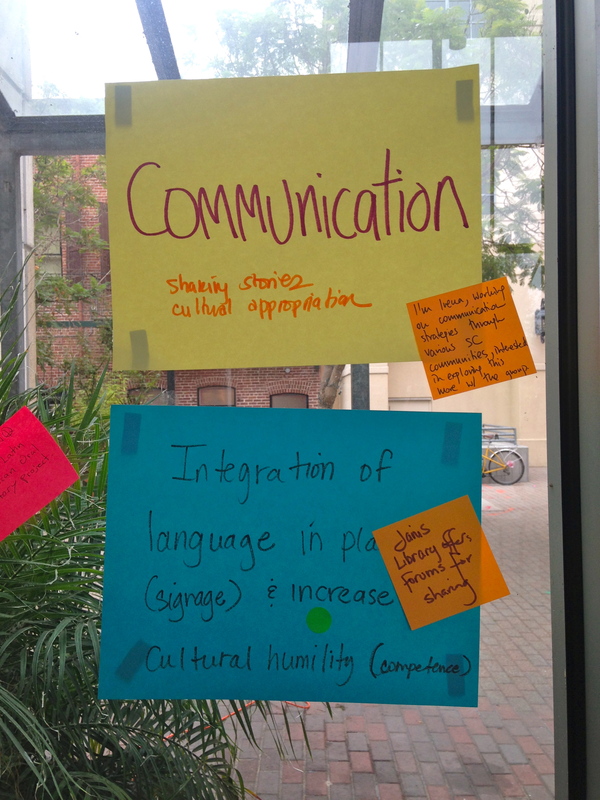 In small groups, we discussed what ideal cultural bridging looks like and pockets of greatness we already see in Santa Cruz County. Some artists in our groups illustrated these dreams. 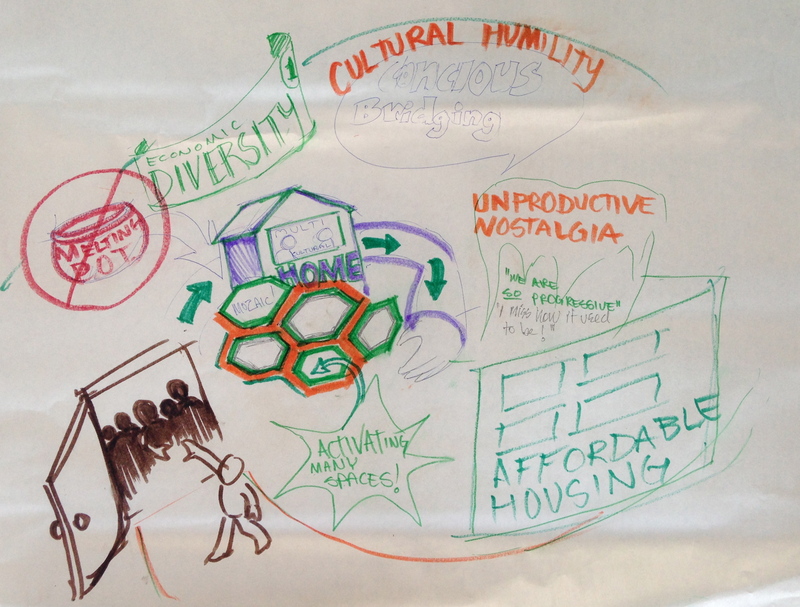 As a full group, we shared responses to map out a vision for cultural bridging together. 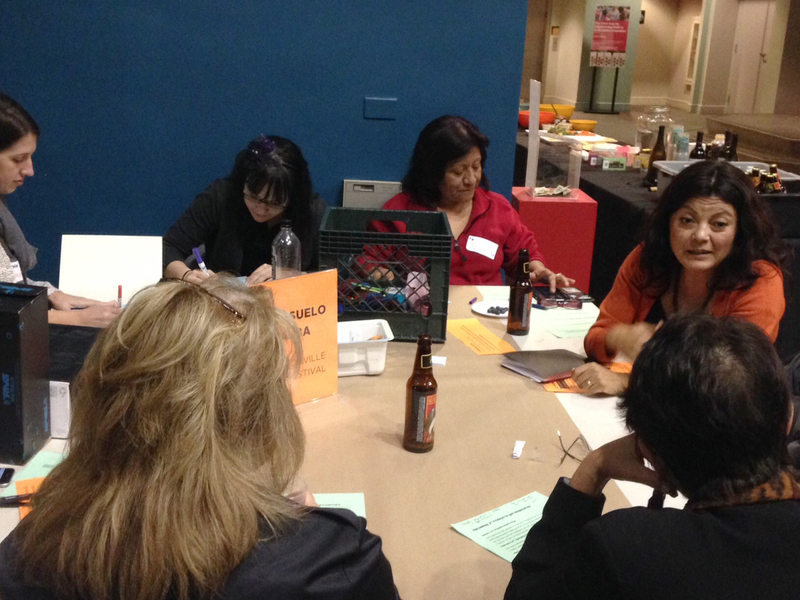 Small groups then discussed specific opportunities and obstacles for cultural bridging. 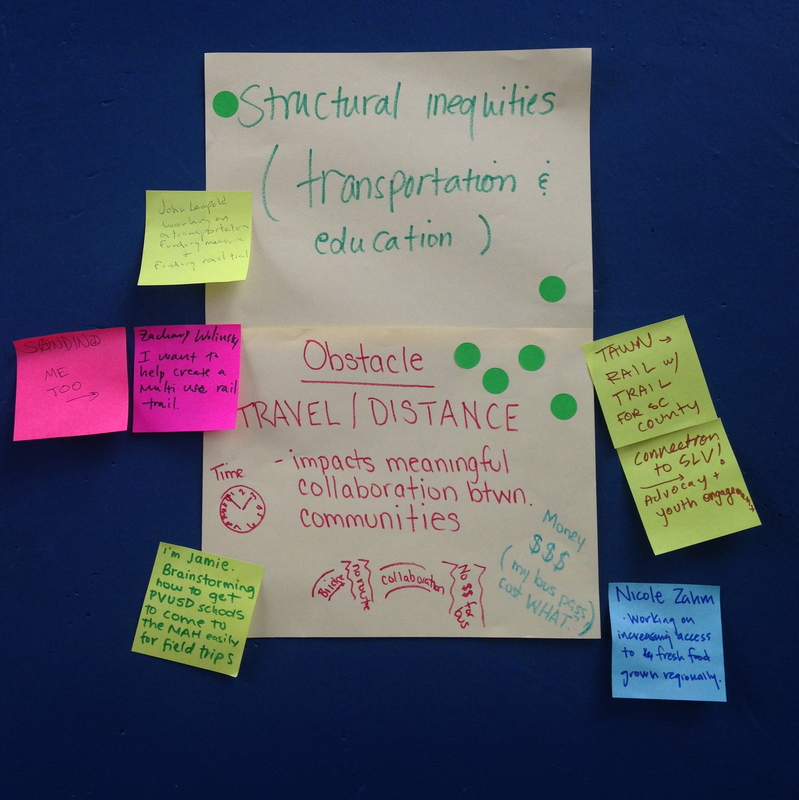 Each group identified 3 opportunities written on blue paper and 3 obstacles written on yellow paper. Alma and I sorted and grouped each topic into broad categories while members got to know each other better (please see this blog post that includes photographs of each grouping). Everyone explored the opportunities and obstacles. Everyone thought about their own work professionally or personally in relation to these topics. 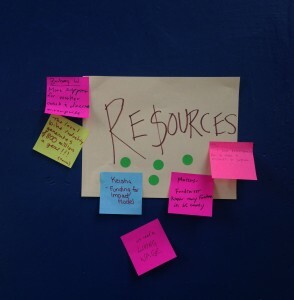 Then members wrote their names and ideas on post it notes if they were working on or planning to work on any of these opportunities/obstacles this year. 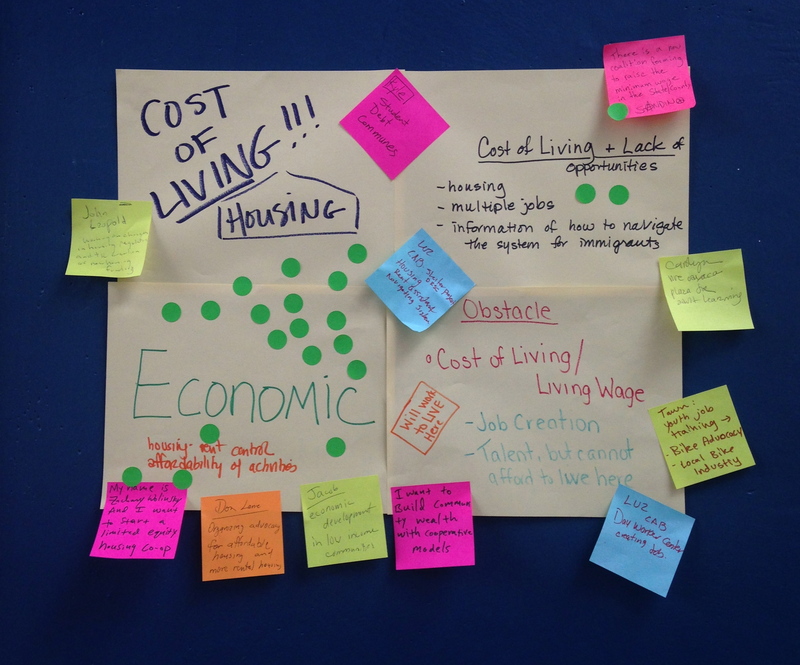 Each member voted with green dots on the obstacle/opportunities they were most interested in exploring through C3. 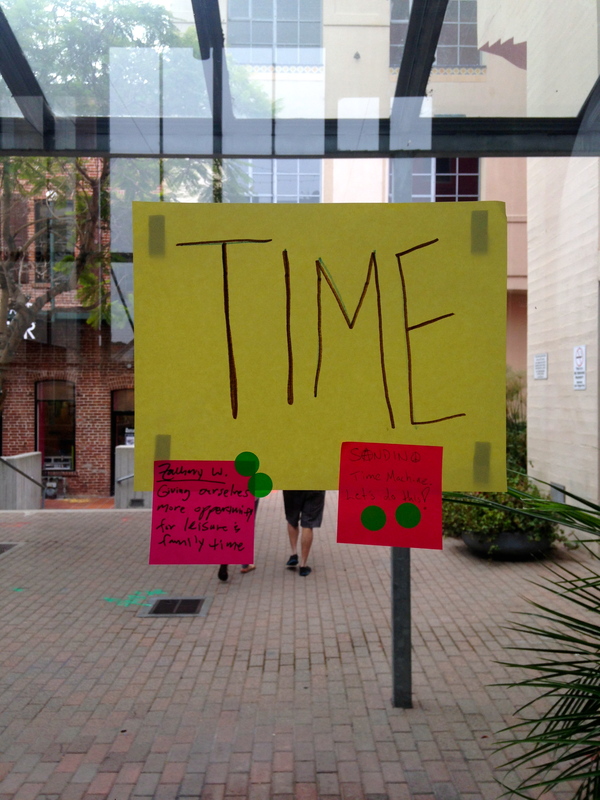 This will help us determine which topics and projects we will dive deeper into in the next two meetings. 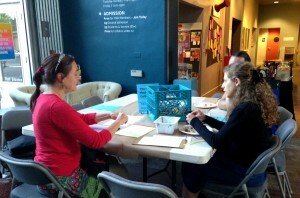 We’ll ask members who are working on projects relevant to those topics to present their work in the next two meetings. 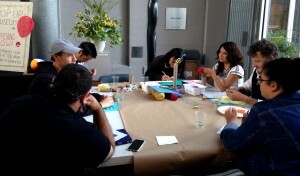 In those meetings we will all creatively brainstorm ways to strengthen that work. The following two meetings after that will plan the most engaging way to share our work and topics with the public at a 3rd Friday Festival at the MAH. 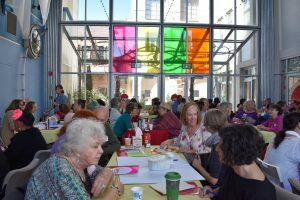 We had a yoga moment, members shared some upcoming events, we had lunch from India Joze with MAH board members and then toured the renovated Santa Cruz County History Exhibition. Alma, Ana, Nina and I are now sorting through all the amazing notes and topics. We’ll narrow it down to a few to focus on and reach out to members working on those topics. We are excited to share those topics and projects with you soon, and dive deeper into creative brainstorming this November! We closed out the C3 2014-2015 group in June. Thank you to everyone who could join us! 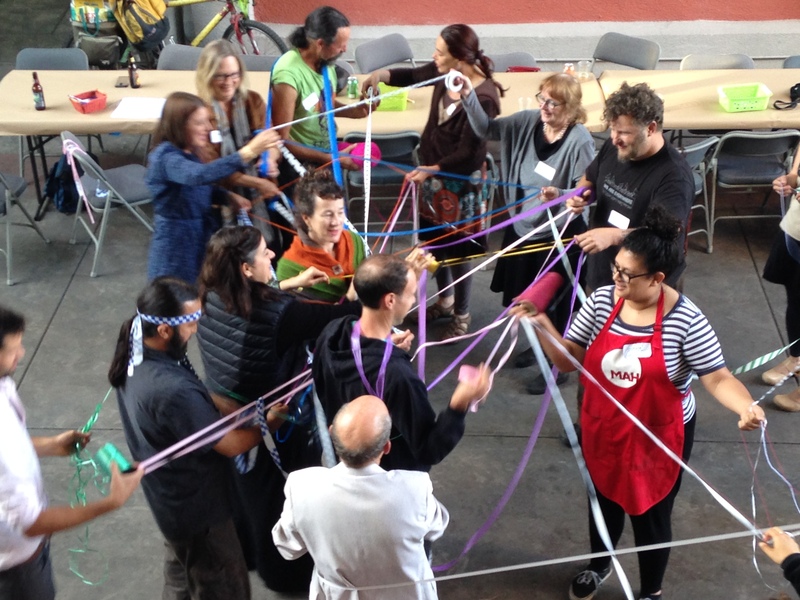 We reflected on and celebrated the C3 connections we made together (you can see those connections in this ribbon web exercise we created). 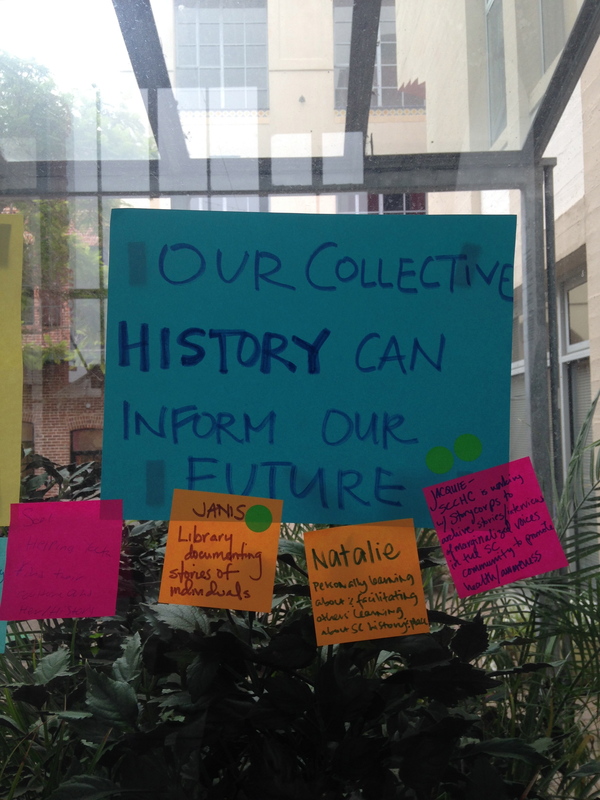 We shared stories, collaborations, new insights and ideas for the future cohort. We ate a delicious dinner from Ballesteros Catering Company. We shared the direction for next year’s C3 to focus on one topic to delve into deeply throughout the year instead of 4 topics. Everyone seemed to feel that this focused approach would allow members to investigate issues more thoroughly and more deeply expand collaborations. For those that missed the last meeting please help us by filling out this final survey here. Thank you all for taking the time and energy to be part of C3. We learned so much from you. 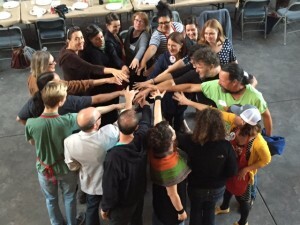 We hope you all continue to connect with each other, and collaborate with one another to make your work and our community stronger. Thank you so much for creating an inspiring year with us! This entry was posted in Blog on July 31, 2015 by Stacey Garcia. This meeting’s topic resonated strongly with us given the current events and the decades of oppression, exclusion and marginalization that continue to persist in our society. Geography & place are intricately intertwined with diversity & culture in our country and specifically in our county. 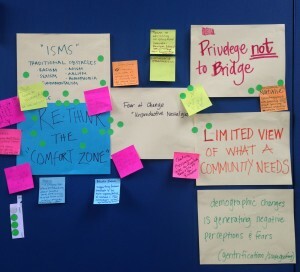 At this meeting our C3 “sparks” shared their current work in creating spaces that are striving to be inclusive of many different kinds of people. Their work is already making space in Santa Cruz to build trust, understanding, empathy and communication across differences. At this meeting sparks shared their work and together we built a dream for a more inclusive future. We kicked off the meeting with a geography exercise that encouraged participants to talk with their “neighbors” to physically situate themselves by where they lived in Santa Cruz County. 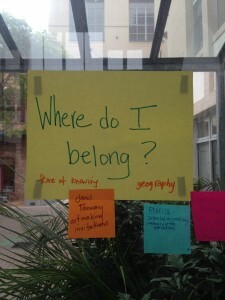 We then asked participants to organize themselves by where they were born. Lastly, we asked members to place themselves by their family’s place of origin. People migrated across the atrium noticing differences and finding commonalities, particularly in that we were, at one point, all immigrants to Santa Cruz. FoodWhat is a youth empowerment and food justice organization using food and sustainable agriculture as the vehicle for teens countywide to grow and cultivate their power and resiliency. FoodWhat partners with low-income and struggling youth to grow, cook, eat, and distribute healthy sustainably raised food which leads to profound transformation and for youth to experience their own success. 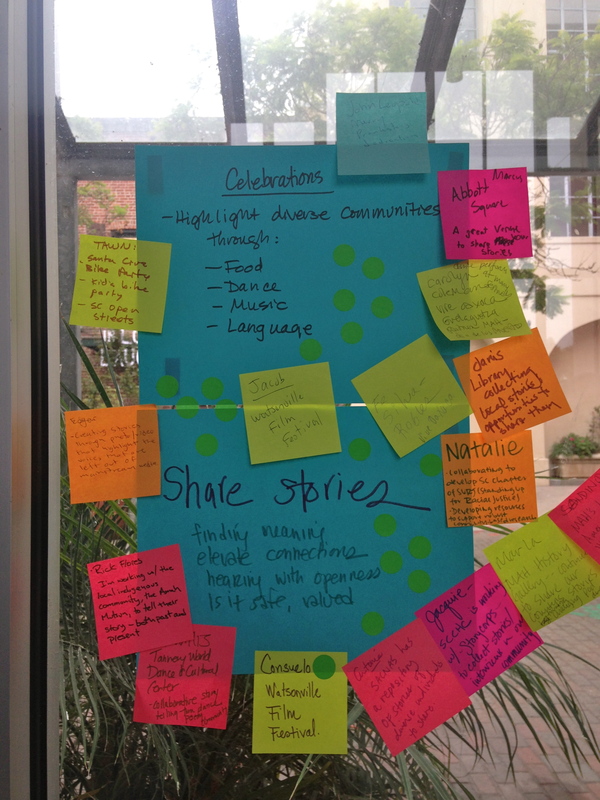 As FoodWhat has grown to serve young people countywide, we are seeking input and connections on our community-based approach to expansion in Watsonville. To get a visual on a day at FoodWhat, you can check out our photo stories here. Silvia will lead a discussion on Geography and Diversity making a critical distinction between the perspectives of the Global North and the Global South, and the need for innovative approaches to address current problems in ways that meet the needs, give voice, and activate the potential of all people. She will introduce what she calls portals to new ways of thinking, two intercultural visual thinking tools she developed and used personally and professionally to learn, heal and transform cultural identity (with focus on dignity of the whole self) and intercultural relationships (with focus on respect and appreciation for differences, and relationship of service). Using the iceberg model of culture, you’ll be invited to bring your project, program or organization to the table.We’ll brainstorm together how you could use these tools to bring forth deeper cultural awareness, sensitivity and wholeness in your life, work or organization. 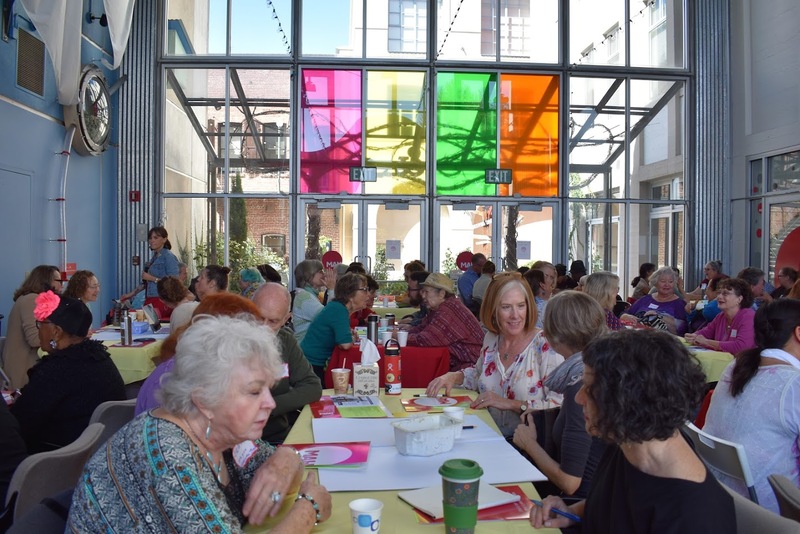 The Museum of Art and History strives to be a welcoming and inclusive space for all residents of Santa Cruz County to build a stronger, more connected community. In our county, 33% of residents identify as Hispanic/Latino. We developed a Latino Engagement Plan this year focused on engaging, collaborating and learning from our local Latino community. Our long term dream is for the MAH to be an inviting space for Latino residents, the percentage of Latino visitors matches the percentage of Latinos living in the City (19%), and MAH staff deepen their own cultural competency which informs MAH programs. Learn about the history and future of Chanticleer Park, a 4.5 acre public space in the Heart of unincorporated Live Oak that County Supervisor John Leopold calls, “the County’s first DIY Park.” In a community full of barriers, ranging from socio-economic to organizational, this project exemplifies how community barriers can demand and foster creativity. See how neighbors have built and maintained an open and heavily used County Park, despite the County losing funds for the needed park during the 2011 fiscal crisis. 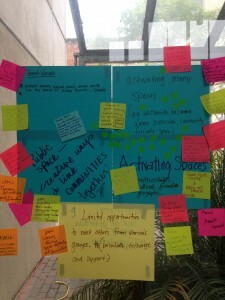 How have the barriers of diverse socio-economics, historically non-existent urban planning, lack of County resources and dense population formed a unique Park, full of kids, dogs, art and bikes? As Chanticleer Park enters a new phase; we invite you to be involved. We are launching an effort to build the County’s first Universally Designed playground at the Chanticleer site. What will it look like? Who will be involved? 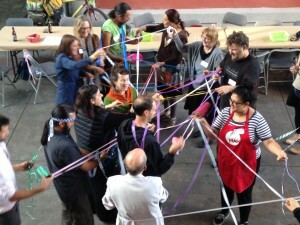 How can the process of designing and building a Playground-For-All offer an opportunity for a community to strengthen? 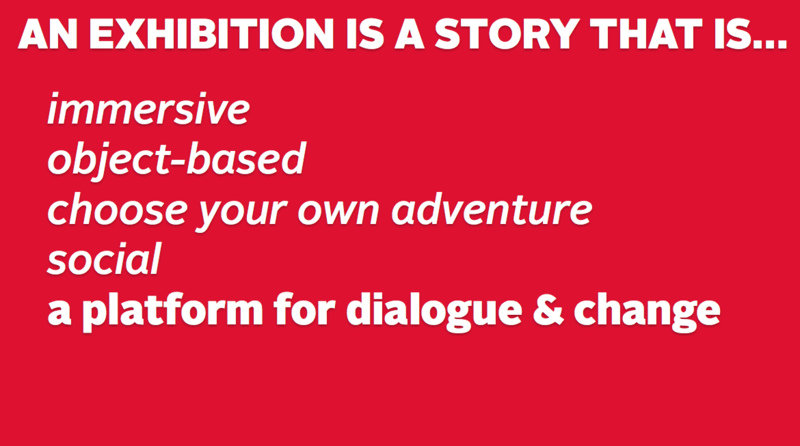 How can our process invite participation for this next phase? Learn about Chanticleer Park Neighbor/Vecinos, Universal Design as an approach and specifically our community partner for the playground portion of the project. 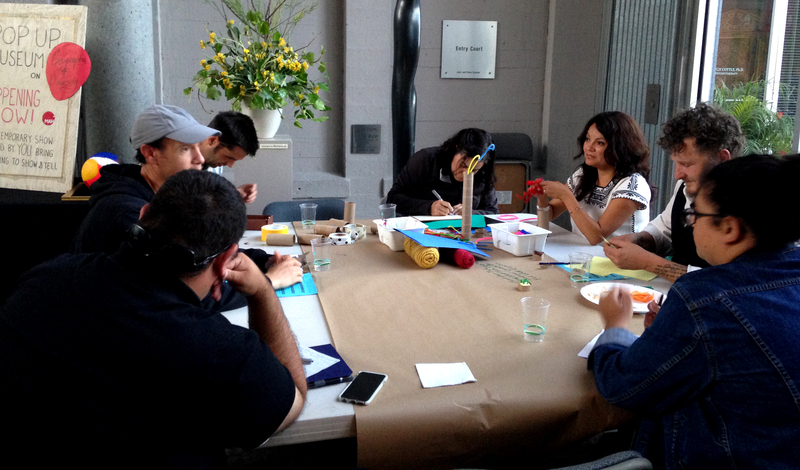 Members brainstormed ideas to strengthen the dream and then each group built an artifact of the future for the Pop Up Museum that represented the dream out of cardboard, paper, pipe cleaners, tape and markers. Objects and their labels were presented to the whole group and can be viewed here. At the end of the meeting each individual either made a commitment to strengthening this work or shared a commitment they had already followed through on. Throughout this year and particularly with these projects presented, we have seen how important collaboration is in bridging across difference, place, people and cultures. This entry was posted in Blog on May 7, 2015 by Stacey Garcia. Our C3 “Sparks” for this meeting are already doing incredible work to improve economic opportunities throughout the county. At this meeting they shared this work and their dreams for its future. Information about the sparks and their dreams can be found here. Our interns and staff designed an icebreaker, The Privilege Walk, inspired by this activity. This required a lot of trust and openness amongst our members. It allowed everyone to see and imagine how access to opportunities in our society have drastic inequalities depending on who you are, where you come from, what you look like and circumstances that are often beyond your control. This helped frame further conversations this evening. Sparks led short 5 minute presentations on their project and their dream for its future. Then, all members chose which project they would like to strengthen based on the interests and assets each individual could bring to the discussion. 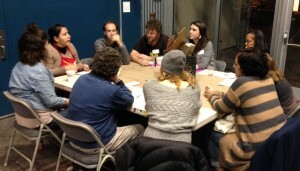 Groups formed around each topic for a more in-depth workshop. Members first shared their interests in joining the group and then asked the presenter more questions about their project. Groups then brainstormed ideas to strengthen the dream. Wes Modes’ group took a different approach to this structure. 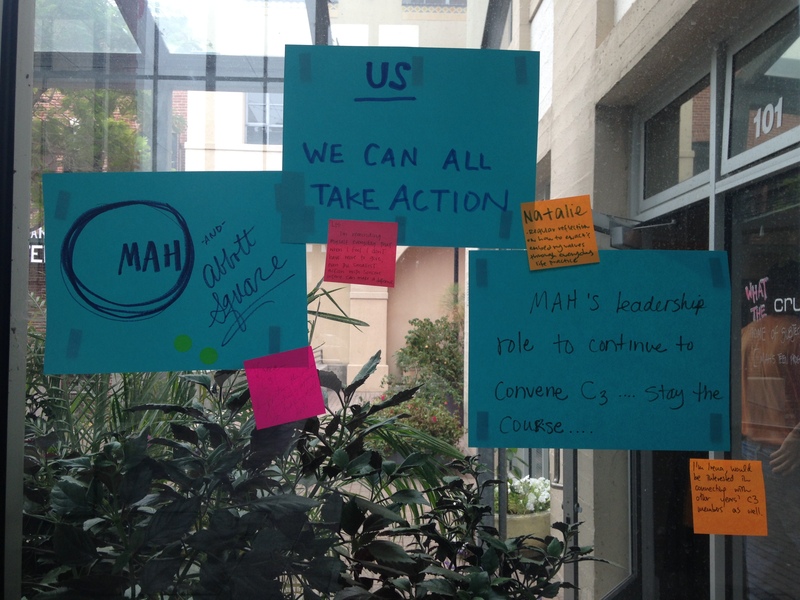 His presentation and workshop focused on empowering other members to advance their own organization’s funding opportunities and brainstorming ways to do that. Each group then built an artifact of the future for our Pop Up Museum that was representative of that dream out of cardboard, paper, pipe cleaners, tape and markers in a mere fifteen minutes. Objects and labels were presented to the whole group and can be viewed here. At the end of the meeting each individual either made a commitment to strengthening this work or shared a commitment they had already followed through on. 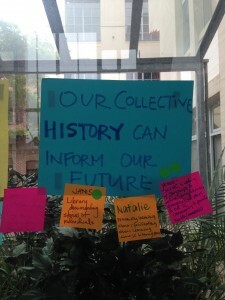 It was inspiring to hear about the collaborations, connections and changes this group has already made in our short time together. We finished with a cheer and rally. This entry was posted in Blog on March 18, 2015 by Stacey Garcia.